This curiously named part of London, pronounced Mar-lee-bone, takes it’s name from a church dedicated to St Mary which was originally built near a small river or stream called the Tyburn or Tybourne. Hence St Mary-le-Burn became St Marylebone. There was a medieval village here which during the 18th century became subsumed into greater London as fashionable people sought land to the west of the city. 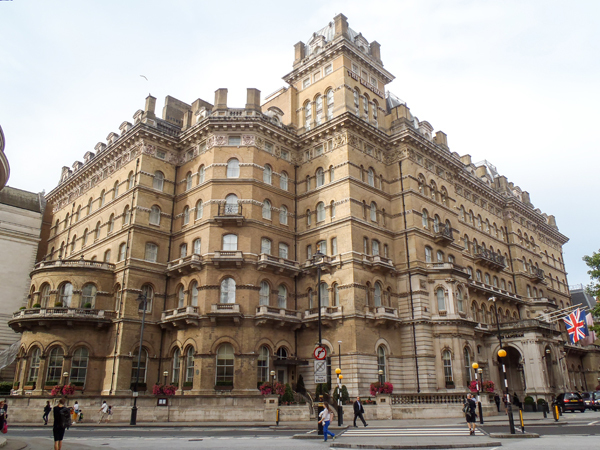 The area – in particular Harley Street – became known as a location of choice for doctors to site their consulting rooms and is still known for its medical establishments. 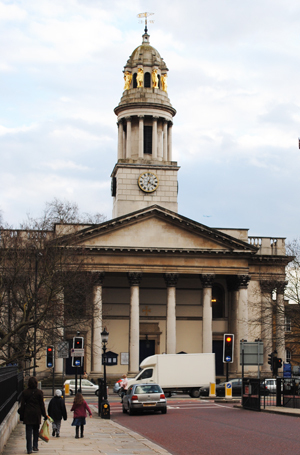 Among the significant sites is the St Marylebone Parish Church (pictured right) which, consecrated in 1817, was where poets Robert Browning and Elizabeth Barrett were married in 1846 following their elopement, the John Nash-designed All Souls Church in Langham Place, the Langham Hotel which opened in 1865 and boasted Oscar Wilde and Mark Twain among guests, 221B Baker Street, fictional home of Sherlock Holmes and now the site of the Sherlock Holmes Museum, and the famous wax museum, Madame Tussauds. Marylebone is also home to the world famous Wallace Collection, bequeathed to the government in 1897, the concert hall Wigmore Hall, the Royal Academy of Music and the Royal Institute of Architects, and the art-deco headquarters of the BBC, Broadcasting House. Marylebone High Street remains a shopping mecca offering a diverse range of independent boutiques and specialty shops while in the south, Marylebone includes one of London’s most famous shopping strips on Oxford Street. 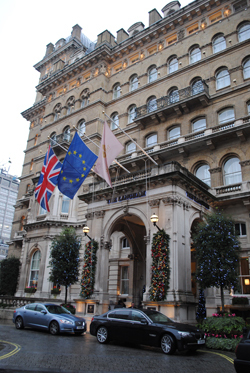 Other famous people connected with the area include four time Prime Minister William Gladstone who lived at 73 Harley Street from 1876 to 1882, writer Charles Dickens who lived at 18 Bentinck Street while working as a court reporter in the 1830s, author Edward Gibbon, who lived at 7 Bentinck Street while writing his landmark text The Decline and Fall of the Roman Empire from the 1770s, and Sir Arthur Conan Doyle, creator of Sherlock Holmes, who worked in Upper Wimpole Street in the 1890s.